Request to schedule an appointment. Houston Inspections in conjunction with Houston Pest & Termite gives to all of our customers a "FREE - NO OBLIGATION" 120 day Subterranean Termite (renewable) Warranty for all of our home inspections we perform that are free of conducive conditions or a current active infestation of wood destroying insects. Approximately 30 days before your FREE Termite Warranty expires, one of customer care coordinators will contact you to remind you that you can extend your warranty coverage. Note: There is no obligation to renew, if you choose not to renew your FREE Warranty simply expires after 120 day and that is it. If you choose to renew your Termite Warranty, all you have to do to start your extended termite warranty coverage is simply make your first monthly payment of $18.75 with a credit card or debit card. "That is less than $0.62 cents per day!" Then, if at any time you believe you see evidence of termite activity, just give us a call and we will send out a technician to further investigate. 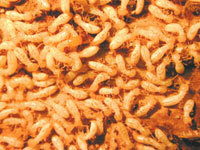 If our technician discovers a termite infestation, we will treat the infestation at no additional charge. That means without you having to pay a deductible or any additional out of pocket expense. IT'S THAT SIMPLE! This also entitles you to a FREE annual termite inspection on your yearly renewal date. "This is a savings valued at $125." We will contact you each year to schedule your FREE termite inspection at a convenient time that meets your busy schedule. This is all performed for you at this low price of $18.75 a month.